I tell you what, having been a listener to TWiT and most of Leo's other shows since the beginning I've been hearing a lot about Audible and have finally decided to take the plunge! There's only one small problem, as an Aussie who lives in Australia and Singapore I'm not sure which of their sites to use. In their English language forms, Audible is made up of Audible.com in the United States and Audible.co.uk in the United Kingdom, neither country of which I'm a resident of. Firstly, I'm not sure whether I'm even allowed to register with either of them in the first place given I'm an international customer; Leo Laporte doesn't even seem sure when he talks about them on his podcasts. And even if were allowed to register with them, would I be limited to downloading only a subset of material? The second concern is about content. If I'm allowed to register with either, do they stock different material? I noticed the Audible.co.uk site had links to BBC productions which made my eyes light up with delight, but would that be limited to their site and not to the American one? Thirdly has to do with presentation. These are audio books so I'll be listening to people speaking for hours on end. I have no trouble understanding most American accents, but British accents on the whole are closer to the pronunciation of English that I'm used to in Australia and Singapore and are easier for me to understand, so if there's a book read by an American and a Briton I'd probably prefer downloading the latter, unless the author themselves are reading. 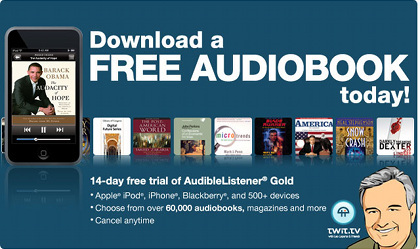 Do the American and British Audible sites offer the same books but read by different people depending on which site it appears on? Finally, and this might end up being the decisive one, as far as I can tell Leo's coupon codes only seem to work with the American one, unless there's a different way of accessing the British site. Perhaps I'll have to email the Audible guys about this.